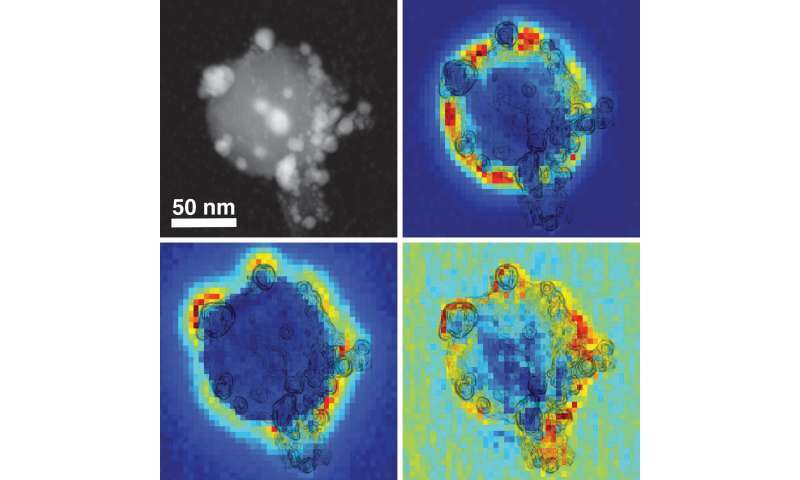 Nanotechnology researchers have long been interested in capturing some of the worldwide catalysis market with energy-efficient photonic materials, metallic materials that are tailor-made with atomic precision to harvest energy from sunlight. Unfortunately, the best nanomaterials for harvesting light—gold, silver and aluminum—aren't very good catalysts, and the best catalysts—palladium, platinum and rhodium—are poor at capturing solar energy. The new catalyst, which is described in a study this week in the Proceedings of the National Academy of Sciences, is the latest innovation from LANP, a multidisciplinary, multi-investigator research group headed by photonics pioneer Naomi Halas. 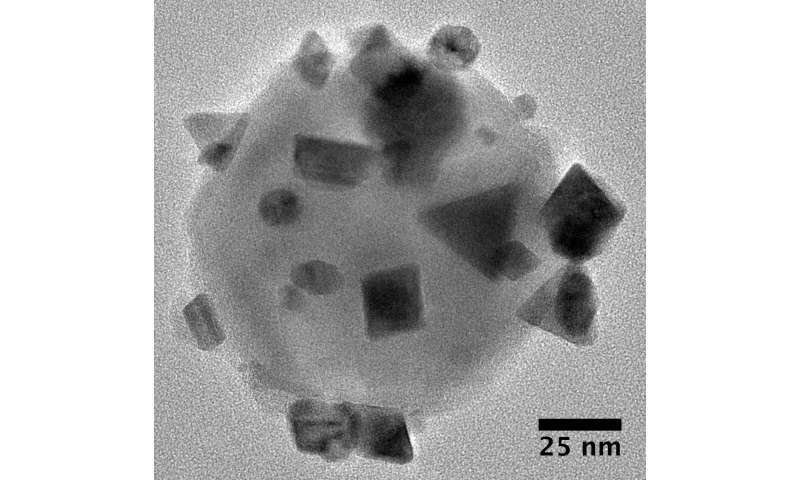 Halas, who also directs Rice's Smalley-Curl Institute, said a number of studies in recent years have shown that light-activated "plasmonic" nanoparticles can be used to increase the amount of light absorbed by adjacent dark nanoparticles. Plasmons are waves of electrons that slosh like a fluid across the surface of tiny metallic nanoparticles. Depending upon the frequency of their sloshing, these plasmonic waves can interact with and harvest the energy from passing light. In summer 2015, Halas and study co-author Peter Nordlander designed an experiment to test whether a plasmonic antenna could be attached to a catalytic reactor particle. Graduate student Dayne Swearer worked with them, Rice materials scientist Emilie Ringe and others at Rice and Princeton University to produce, test and analyze the performance of the "antenna-reactor" design. "You need to add energy to improve the catalytic efficiency," he said. "Our catalysts also need energy, but they draw it directly from light and require no additional heating." Ethylene is the chemical feedstock for making polyethylene, the world's most common plastic, which is used in thousands of everyday products. Acetylene, a hydrocarbon that's often found in the gas feedstocks that are used at polyethylene plants, damages the catalysts that producers use to convert ethylene to polyethylene. For this reason, acetylene is considered a "catalyst poison" and must be removed from the ethylene feedstock—often with another catalyst—before it can cause damage. One way producers remove acetylene is to add hydrogen gas in the presence of a palladium catalyst to convert the poisonous acetylene into ethylene—the primary component needed to make polyethylene resin. But this catalytic process also produces another gas, ethane, in addition to ethylene. Chemical producers try to tailor the process to produce as much ethylene and as little ethane possible, but selectivity remains a challenge, Swearer said. "The polyethylene industry produces more than $90 billion of products each year, and our catalysts turn one of the industry's poisons into a valuable commodity," he said. "The antenna-reactor design is modular, which means we can mix and match the materials for both the antenna and the reactor to create a tailored catalyst for a specific reaction," she said. "Because of this flexibility, there are many, many applications where we believe this technology could outperform existing catalysts."